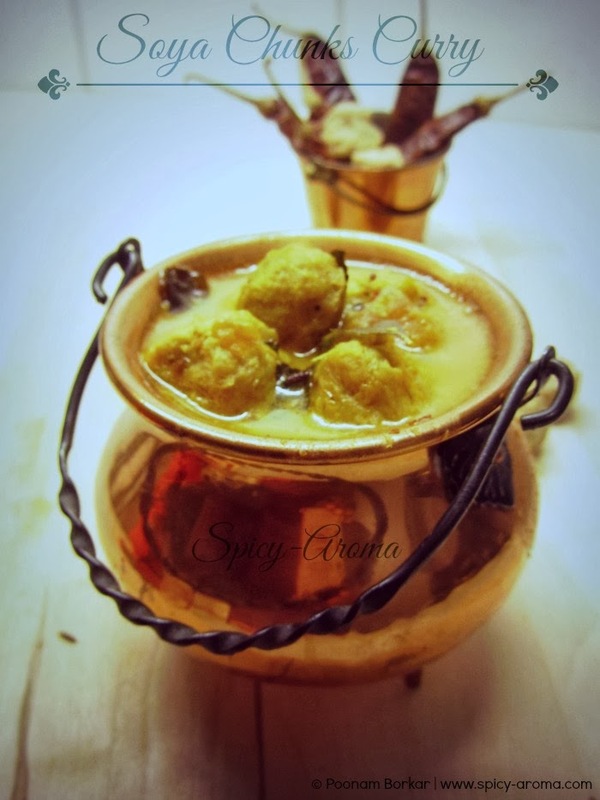 How to make soya chunks curry with coconut milk? Boil soya chunks for 10-15 minutes and drain the water. Squeeze them and keep aside. Dry roast all spices mentioned above on low heat until fragrant. Then add desiccated coconut and roast until light brown. Allow it to cool down little bit and then grind it to a coarse powder. Heat up oil in a pan. Once oil is heated, add mustard seeds, cumin seeds, asafoetida, curry leaves and turmeric powder. Let the seeds splutter nicely. Add tomato and ginger and cook until tomato is tender. Add freshly ground spices powder and cook until oil starts to separate, stirring occasionally. Add squeezed soya chunks and mix well. Simmer the curry on low heat for 15-20 minutes and it is ready to be served.